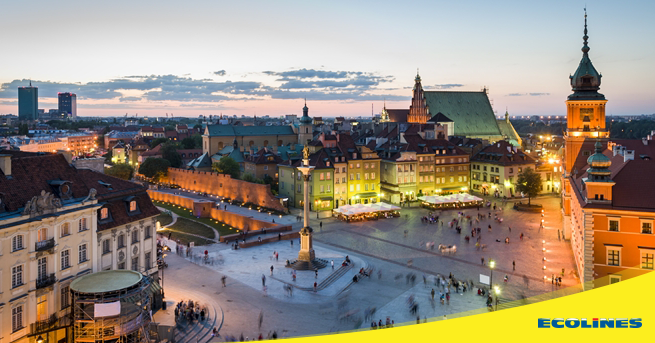 Travel Kyiv - Warsaw with ECOLINES buses. Comfortable seats, tablet - movies, music. WC, WiFi, 220V, drinks - coffee, tea. 3 free bags. To find out ticket price and bus schedule, please visit the sales system. Campaign valid from 01.04.2019 till 31.05.2019. Only for journeys from 01.04.2019 till 31.05.2019. -Ticket price for bus Kyiv — Warsaw in sales system by selecting the date and time of travel. -Distance between cities Kyiv and Warsaw-787 km. -Average time on road in route Kyiv — Warsaw: 14 h 11 min. -Time difference between the cities Kyiv and Warsaw - 1 hours. You can save your time and buy ticket for bus Kyiv — Warsaw online or in one of our offices. When buying a ticket online you have to choose the route, departure date, number of passengers and click "Search". In the same way you can check seat availability on the route Kyiv — Warsaw. Buying a ticket for bus Kyiv — Warsaw is possible in 8 different currencies: EUR, PLN, BGN, RUB, UAH, GBP, CZK, BYN. In order to buy a ticket for bus Kyiv — Warsaw cheaper or get it for free in the future, sign up for our loyalty system.